Manufacturers across Asean entered the new year with subdued activity, with only the Philippines and Myanmar seeing increased Year-on-Year (YoY) output. Both, however, saw the majority of their annual increase eroded in the first month of 2019, with only Malaysia seeing month-on-month (MoM) growth. The grim start to the new year is reflected in the Nikkei Asean Manufacturing Purchasing Managers’ Index (PMI) which shows countries with significant exports to China starting to feel the effects of the deepening US-China trade war. 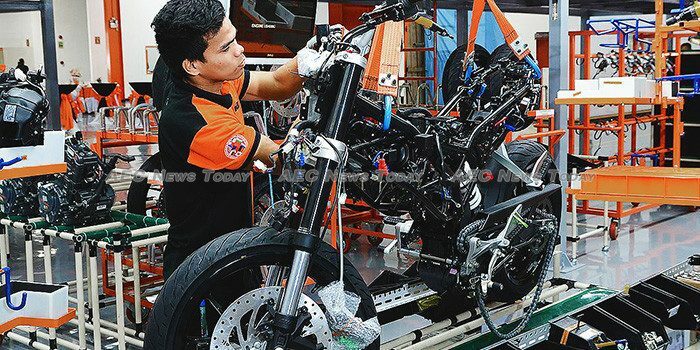 Reporting the biggest slowdown in new orders in almost two-and-a-half years, Vietnam saw the greatest fall in PMI, dropping 2.81 per cent MoM and 3.53 per cent YoY.Despite the slower output the country still reported the strongest increase in workforce numbers throughout the region for the period. After recording a 2.9 per cent increase in its PMI for the previous 12 months, manufacturing in the Philippines saw much of its gains eroded, its Nikkei PMI ranking dropping 1.69 per cent MoM to 52.3, but still up 1.16 per cent on a year prior. Showing the most resilience and experiencing the smallest fall in PMI in January was Thailand, which saw little change over a year earlier, followed by Indonesia. Registered the weakest PMI for January was Singapore, which saw a 0.87 per cent decline MoM from 46.0 in December, 1.72 per cent lower than its position a year prior. The island city-state also recorded the sharpest decline in workforce numbers for the month. Displaying a similar trend a local PMI survey compiled by the Singapore Institute of Purchasing and Materials Management (SIPMM) showed the Republic’s Purchasing Managers’ Index (PMI) for January slipped 0.4 points, or 0.87 per cent to 50.7 points, its lowest since December 2016. The fall was the fifth continuous month . 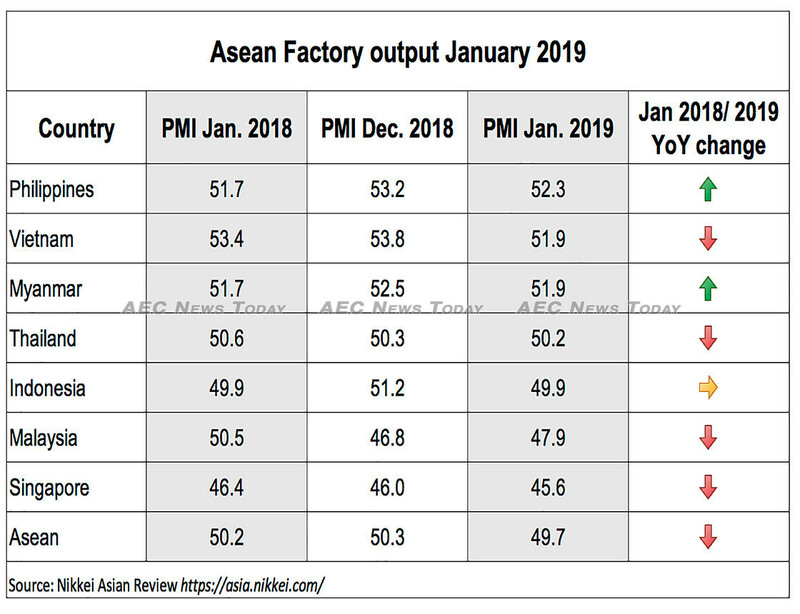 After staying fairly static for the previous 12 months the Asean PMI started the year 1.19 per cent lower at the end of January than, than at the end of the December 2018. 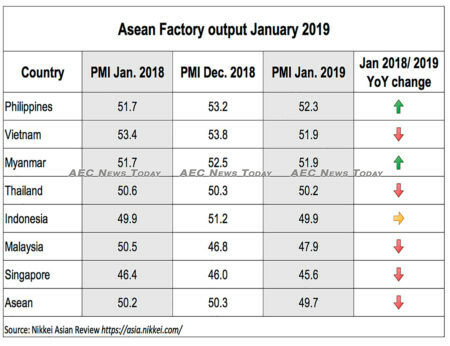 David Owen, economist at IHS Markit said, “Asean countries struggled at the beginning of 2019 as manufacturers saw new orders fall and output growth moderate from December. “Export demand was still a key factor weighing on the sector’s performance, as trade tensions around the world caused export orders to fall for the sixth month running”. The report noted that employment growth halted after the longest period of expansion throughout the series, with output prices in January seeing the weakest uptick in over two years. Despite the subdued start to the year business sentiment for the year ahead was at its highest since May 2018. Looking ahead, firms were bullish that the business conditions will rebound and output growth spirals. Business owners in the Philippines were reportedly the most optimistic, while those in Myanmar were the least upbeat. Based on the health of the manufacturing sector using five indicators, such as, sales, employment, inventories ,and prices, data for the Nikkei Asean Manufacturing Purchasing Managers’ Index was collected from a representative panel of around 2,100 manufacturing firms in Asean, accounting for an estimated 98 per cent of manufacturing activity.